Create a uniform look with our easy to clean and easy to stack plastic tumblers in your choice of amber, blue, red, or clear. These popular beverage servers are made from SAN plastic and were designed with a textured surface to increase the lifetime of its use. Ideal for use in demanding environments such as schools and chain restaurants. Choose from 5 oz, 8 oz, 9.5 oz, 12 oz, 16 oz, 20 oz, and 32 oz. QUALITY - Made from durable, shatter resistant, food safe ABS plastic. Dishwasher safe. STACKABLE - Stacking lugs prevent jamming when stored. 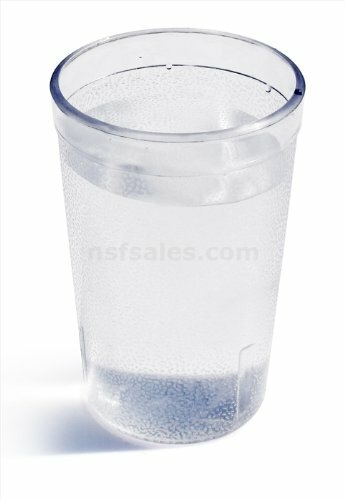 TEXTURED - Textured pattern hides scratches, makes cup more slip resistant. OPTIONS- Available in 4 colors and 7 sizes. DIMENSIONS - Height 4.4 Inches, Top Diameter 2.8 Inches.